Judge Edith Jones and the dismissal of the ethics complaint « Hercules and the umpire. Let me expand on your point four. This action is a typical left wing political tactic undertaken by well-off people with too much time on their hands and for whom politics is 24/7. Moreover they want to accomplish by other means what they can’t do constitutionally. Judge Jones has a lifetime appointment and they don’t like it. So they harass her under the guise of an “ethics” complaint with zero downside for them. It kind of reminds of the shameful Justice Clarence Thomas confirmation hearing. No video or audio tapes there either. I won’t even bother to read the affidavits and complaint as I am sure they are filled with lies, distortions, misrepresentations and half-truths. Because that’s the way the Left rolls. Chilling? Try on the fact she will probably never make such a speech again. Why bother? Just go play golf with Obama. I doubt very much that Jones will be deterred. Am a little bothered by very ideological speeches from judge on either side, since they do contribute to the perception that division within courts are merely partisan. However Cornhead’s view that this is left only is totally inaccurate. Particularly in the academia, the right has spent a good deal of time inciting criticism, and there are some ugly stories in law schools about conservative student groups and evaluations. Hearsay but all the best gossip is. The notion that half truths are the way of the left is both unfair and unfounded, both sides are capable of inappropriate conduct. If the judge does not like death threats, he should have taken death threats over the phone at 12 from some of the good Republicans of NE. I agree that being nasty and intollerant goes both ways. All the best. Would all this have happened had Judge Jones not been a noted conservative jurist with opinions contrary to those held by the groups complaining about her? I doubt it. You are likely correct that this complaint was a “shot across the bow” intended to intimidate future (conservative?) judges from engaging in judicial speech. What’s worse is that perhaps it is an intimidation tactic intended to prevent judges from holding certain positions in their judicial capacities which are contrary to those espoused in the academy and in Left-leaning circles. Such conduct must be met with the strongest opposition by the Bench and Bar when it is shown, as here, to be entirely bogus. And, BTW, despite my own Right-of-center political leanings, I would be just as outraged if this sort of thing happened to a “liberal” jurist by “conservative” groups. I agree that the practice of trying to silence those with whom you disagree is generally reprehensible, early treatment of Justice Thomas was exemplary. If you doubt only conservatives are treated this way by academics you are living in a dream world. Each side has its share of meanies. My residence is of no moment. In fact, it is one side–I’ll let you take a wild guess which one it is–which holds sway, with some small exceptions, amongst what I call the “Big Three”: 1) Hollywood; 2) the media; 3) academia (not surprisingly, this incident arose out of a speech in an academic setting). Given that premise as correct, your suggestion of equivalence by those on both sides of the political spectrum rings rather hollow. I do not see enough movies to comment, media talk is nonsense, largely comes from listening to Fox denounce MSNBC and visa versa, I watch neither, if your talking about economics most American economists are conservative to middle of the road, if your talking about the legal academy you are many years out of date, and nobody listens to the humanities, I do not know enough about the politics of the sciences to comment. I have moved you from dream land to cloud cuckoo land, but you may respond that I am as monotonous as the frogs. I can assure you of the following: 1) my residence is of no moment; 2) you need to get out more. If the complaint had been directed at Judge Jones’s point of view, Judge, some of your comments would be warranted. But it was not. Your summary statement – “The complaining parties did not like what Judge Jones said, so they filed the ethics complaint against her.” – seems quite misleading to me. The complaining parties relied on affidavits from University of Pennsylvania law students, mostly, who had attended an open meeting of a campus group. The affiants quoted Judge Jones’s comments as best they could, much of it from contemporaneous notes they had taken and texts they sent to friends while listening to the speech. The remarks they quoted (please, read the affidavits) were objectively racist, express a clear pre-judgment against categories of legitimate legal claims, and expressed her personal religious beliefs in a way that strongly suggested she believes these should and do influence her rulings as a judge. The affidavits were signed under penalty of perjury. How is this not credible evidence to support a serious complaint of judicial misconduct? (The complainants are no doubt opponents of the death penalty, but to their credit, they had attended the meeting in order to hear an articulate and prominent speaker with an opposing viewpoint. This was in the best tradition of education for future lawyers.) Although the Federalist Society organizers of the event solicited counter-affidavits, it is my understanding that they found no one who had attended and was willing to swear the quoted remarks were not made. Criticism of the drafting or editing of the complaint itself is a red herring. The decision of the Special Committee makes it clear that the members did not find credible evidence to support the factual claims. If you want to argue about the factual claims, then I suggest we talk about a specific claim and why the Special Committee’s factual analysis is flawed. By the way, the make up of the Special Committee was far more “liberal” than Judge Jones. There is no reason to think that they were “in the bag” for Jones. I never suggested that the Special Committee was politically biased. I don’t know where you got that impression. Unlike some of your commenters, I do not engage in that brand of ad hominem argument or name-calling. I read the affidavits, which were filed by Penn law students who attended the talk and quoted the speaker’s remarks. I also read the report. The committee’s assertion that there was no credible evidence baffles me. The complaint, the report, and the petition for review are each dozens of pages long. There is no way we can — or should try to — debate or reargue the merits here. My comment was directed as fleshing out what your characterization obscured, that the complaint was not about whether anyone “liked” what Judge Jones had to say. pdga First most people are not good listeners, and law students are worse than most. Second we hear what we expect to hear as much or more than what is said. Third people who went to make notes were there expecting what they reported given her reputation. Given that she denies saying it how would you resolve this he said she said. More frightening is the idea that politically committed students think it is their job to spy on lecturers and teachers with whom they disagree looking to make a complaint. I do not worry about federal judges, not a timid lot, but non tenured faculty are likely to trim their sails, particularly because of the tendency of students to get sucked into faculty politics. Students should hear different voices, even diva judges..
Fair enough. I agree that the one sentence that you keyed on in my post could have been written better, that is, more nuanced. All the best. Pingback: On being “uncomfortable” and “offended”–the ethics complaint against Judge Jones and the student affiants « Hercules and the umpire. Every time this case has appeared or re-appeared in the news, one of the main things that pops up in my head is surprise that there is no recording of an organized, formal legal event like this. Is that unusual? Relatedly, do judges typically (or not infrequently) insist that their extra-judicial speeches at events such as these not be recorded? Cornhead, if you don’t mind me saying so, you seem to have a bit of a chip on your shoulder. If you sincerely believe that your side is on the side of the angels and the other enjoys intimate relations with Satan every morning, you have lost your perspective. That kind of judicial modesty is almost a dying art. What we are left with is a band of arrogant proxies for political parties like Edith Jones, who have been caught saying that she is too important to decide “minor” appeals like yours. William M. Richman, Much Ado About the Tip of an Iceberg, 62 Wash. & Lee L.
Rev. 1723, 1728 (2005). The rule of law has been supplanted by the rule of judges, who have become so self-important that they rarely bother to explain why they rule they way they do any more. Judge Kopf is swimming against a tidal wave. If this is the way you “roll,” you are part of the problem. You think nothing of judging without considering the facts, and even boast of it! I will call Senator Hatch, and recommend you for the federal appellate bench. You will fit right in…. Some Supreme Court Justice ban recordings. 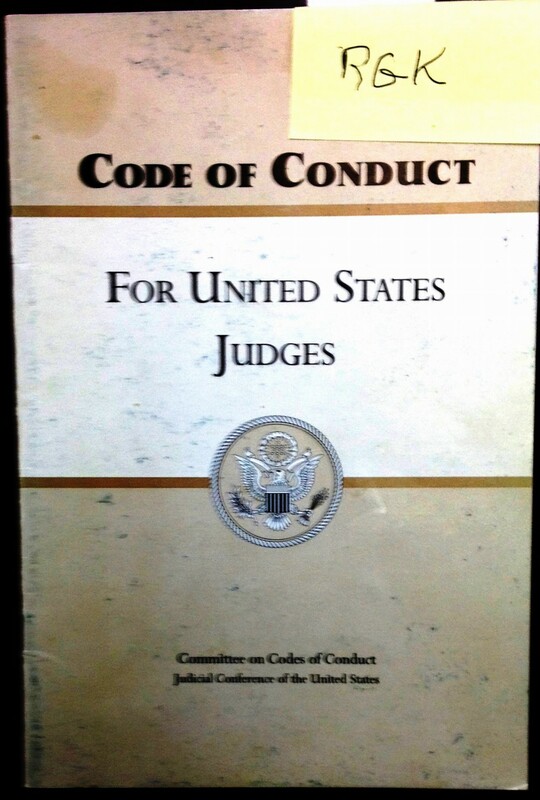 I don’t know about other judges. When I speak (and that is infrequent) I don’t care if somebody records what I have to say, but I certainly don’t require that the sponsor record my remarks. All the best. Courts have a nasty habit of finding the facts they need. OTOH, I would have liked to see the Committee just assume the allegations as true and dispense with the chicanery. She said what they said. So what? Jones is an originalist? Why isn’t everyone? She has opinions? BFD, As long as she applies the Constitution without fear or favor — a tall ask for most judges — it doesn’t matter what she says in a speech. Half the bench moonlights. Should every lecture be recorded and made available for scrutiny? I’m sure we could find a gold mine or two. Scalia even had a reporter kicked out — and unceremoniously, by the US Marshals — for the unforgivable sin of recording one of his speeches. Imagine the cheek! Heaven forfend that anyone should actually use that arrogant idiot’s words against him. No, the groups that have filed this complaint are not, so far as I can tell, “well off.” Texas Civil Rights Project is far from well off – LULAC is the same. They are non-profits, after all. I assume their complaints were sincere. The local newspaper here in San Antonio reported her to have said that certain racial groups are “predisposed” toward crime. In reviewing the affidavits, I see two witnesses said she specificlaly did not say that. A third witness, African-American, said she did indeed say that. When this African-American attendee asked a follow-up question, she backed off that earlier statement. Whatever she said, I am glad to see she walked it back a bit. But, still, as someone who represents victims of discrimination, I certainly hope to avoid appearing in front of her. Frankly, IMO, those are not the sort of things a federal judge ought to be saying – even though they do not violate judicial ethics.